Following on the success of her recent Blyski / Flashes (more...), this next volume, Mowiac nie tylko do siebie / Talking not only to Myself, presents the poet's impressive achievements in the realm that lies between poetry and prose. This time Julia Hartwig offers readers a prose poem, the form of literature she loves best and one that derives from French literature. Hartwig proves herself to be Poland foremost master of the form. "I debuted in the 'Antologia poetow lubelskich' / 'Anthology of Lublin Poets' with two youthful prose poems, unclear at the time about what distinguishes this form of literature and unaware of its mysteries. This is a form to which I would return over many years, whenever I felt it was demanding something from me. I treated it on par with what I call poetry," writes the author in the "Afterword." 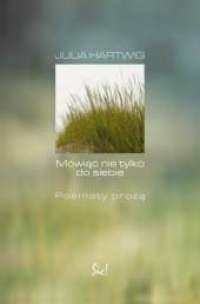 The book is accompanied by a CD containing recordings of Julia Hartwig reading a number of poems of her own selection.